When the World War II Valor in the Pacific National Monument was created in 2008, it included an often overlooked, albeit hard to miss, piece of Pearl Harbor history. Located along the southeast side of Ford Island in what was known as Battleship Row sit three concrete structures known as mooring quays. Designated as Mooring Quays F6, F7, and F8, these slabs of painted concrete were once used to secure the naval vessels that were moored along Battleship Row. Originally there are 16 mooring quays, lined up in pairs and designated F1 through F8, but only the last three pairs were included as part of the national monument, which has since been renamed the Pearl Harbor National Memorial. Due to the deterioration of the concrete, the mooring quays have become the focus of restoration efforts that are being spearheaded by the Concrete Preservation Institute Field School, an organization founded to provide hands-on skills training for US service members transitioning to civilian life. Though they may appear inconsequential, the mooring quays played a significant role not just before and during the December 7, 1941 attack on Pearl Harbor, but also when it came to the recovery operations after the onslaught ended. In the months that followed, USS California (BB-44), USS West Virginia (BB-48), and USS Oklahoma (BB-37) were refloated by salvage crews. In order to right these ships, the salvage vessels and barges used the quays as moorings. They also proved useful in creating ship-to-shore bridges during the salvage operations. Before the attack on Pearl Harbor, the Battleship Row mooring quays were simply a cost-effective means of addressing a space problem. 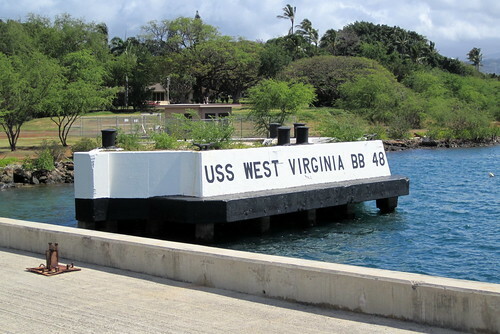 They were constructed to help relieve congestion in the harbor and provide “additional berthing for capital ships at Pearl Harbor,” according to a Navy document. They served the same purpose as a pier, but were considerably less expensive to construct. They may be physically small, but a they’re an important piece of Pearl Harbor history. So, shortly after the the creation of the World War II Valor in the Pacific National Monument, the mooring quays were assessed for structural integrity. Being the last remaining structures along Battleship Row from the attack on Pearl Harbor, the hold significant historical importance. When it was determined that it would be a costly project, the National Park Service partnered with the Concrete Preservation Institute on a five-year restoration endeavor that started work in 2016. When you visit Pearl Harbor, some of the mooring quays can be seen from the Remembrance Circle, and a better view of them can be had on the narrated US Navy shuttle boat tour of Battleship Row.